BANGI 29, Mar 2012 – There is a need to nurture noble values among the people to build individuals who will put their obligations to the nation first before personal interest. The success of a nation depends on its populace who are imbued with good values such as being honest, trustworthy, responsible and hard working. This has to be given proper attention if the nation is to succeed. This was stated by former Prime Minister, Tun Dr Mahathir Mohamad when meeting students of the PermataPintar programme at the National University of Malaysia (UKM) campus here today. He took part in a question and answer session with a penal of the PermataPintar students. The panellist were Tan Zhi You, Tengku Nor Azira Tengku Mohd Salem, Menusha Arumugam and Nur Syazana Natasha Hashim. The session was to enable the students who are among the brightest in the country to learn from one of the great minds in Malaysia. 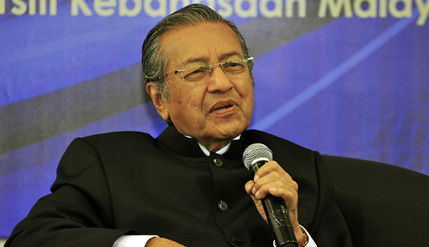 Dr Mahathir said the country still lacks an in depth nurturing of noble values and a concerted effort on character building. As a result knowledge and power have been abused for personal interests. It is not that difficult to be successful but the people have to hold on to their good values, he told the students. He gave the example of Japan where after losing the war, the Japanese were willing to work for a bowl of rice to develop their country. These hard working attitude was what made Japan win in the economic war against the West. He said knowledge can lead to power and power is a trust that must not be broken. But there are people who misuse that trust for their personal benefit. These people will eventually end up with failure because they don’t hold on to the good values. It is only with the upholding of good values that we can ensure we will be a successful nation tomorrow. Tun Dr Siti Hasmah Mohamad Ali; UKM Vice Chancellor, Prof Tan Sri Datuk Wira Dr Sharifah Hapsah Syed Hasan Shahabudin; PermataPintar’s Director, Prof Dr Noriah Ishak and management staff and other senior members of the university and the PermataPintar’s students attended the session.